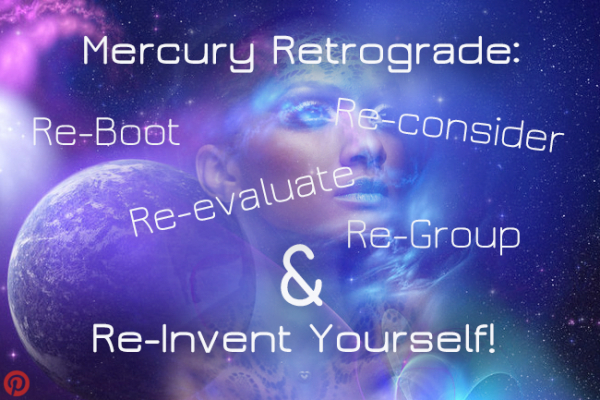 Mercury Retrograde in Aquarius: Re-Boot, Re-Group & Re-Invent Yourself! On January 21st Mercury goes retrograde in Aquarius (17-1 degrees) until February 11th. Time to hit 'Refresh' and step out of our usual activities for a breather! Aquarius is an air sign - its main function the intellect, focused on a social scale. Mercury Retrograde in Aquarius is a time to carefully re-think our course and review our relationships and social contracts. Aquarius also loves to be different and is associated with innovation and with far-reaching ideals. Mercury retrograde in Aquarius is a great time to find original solutions, re-invent ourselves and regroup around a worthy cause. It's an opportunity to lift our eyes from the daily grind and reconnect with our dreams and ideals. And it's also a great time to catch up with old friends. The most intense moments of Mercury Retrograde happen around the stationary points: January 21st and February 11th. Try to avoid the 2-5 days either side of these dates and be extra vigilant for possible blunders at those points! (Check out our Mercury ‘blooper-reel’ at Mercury Retrograde and World Events) Indeed, most mistakes happen out of haste and carelessness at the Mercury direct point (in this case February 11th), when we are eager once more to get on with things - don't let that be you! Mercury has been slowing down since he first entered Aquarius on January 5th, so we are already feeling its effects right now. Time to start winding down our usual activities so we can fruitfully re-direct our focus. Do activities that relax, rejuvenate and revive you. If an old job, project or relationship reappears, go straight ahead. Keep a back up your work / hard-drive / devices. Take extra care if travelling: leave extra time to get there; make sure to have all important paperwork with you; put your contact details on your suitcase. Don't sign new deals / don't launch new projects, unless you have been working on them or know the person for a long time (not e.g. since last week). If you must launch or sign, do your due diligence, read the fine print and be prepared to repeat or revise if need be. Where is your Star-Sign due for a Re-Boot? Check your sun-sign and Ascendant below. Aries / XI House: Time to reconnect with old friends! If you are organising get-togethers or collective projects, pay extra attention to the arrangement details and communications. Also a good time to realign yourself with your dreams and ideals! Taurus / X House: Time to review your life-direction, brand and public image! Watch out for professional misunderstandings or delays. You can revisit old career goals, re-establish your authority or reconnect with VIPs from the past. Cancer / VIII House: A chance to review your finances and find ingenious solutions to cut costs and increase revenue. Don't sign financial paperwork now unless it's something that's been brewing for a while. Also a fabulous time to clear the air and deepen your commitment to a special someone! Leo / VII House: Time to revise your approach toward relationships and reconsider what you want from the other person. Don't finalise contracts now - take time to do your research. An old relationship may come back into your life for another chance. If so, go for or it! Virgo / VI House: Time to review your working habits, nutrition, exercise and daily routine. Beware of technical errors, delays and misunderstandings at the office and back up your work. An opportunity to relax your nerves, catch up with errands and re-establish a healthier life-style! Libra / V House: A perfect time to indulge in a favourite hobby, relax and have some fun! An old lover may return or your child may be trying to tell you something. This is a wonderful opportunity to rejuvenate and remember the things that make you happy! Scorpio / IV House: An excellent time to de-clutter and reorganise your home-base and lighten your heart. You can revisit and complete family and home-projects that have been stalling but be extra clear in your communications. A good time to have personal discussions and clear the air. Sagittarius / III House: Time to shut out external distractions and examine the contents of your mind. Be extra vigilant with all communications and travel, keep back ups and avoid signing on the dotted line. A great time to do research or creative writing. Also a good time to reconnect with a sibling. Capricorn / II House: Time to review your income and expenses and find clever solutions. If an old check is overdue it may now arrive. Beware of being given the wrong change, or mistakes on your bill or invoice. An excellent time to re-asses your core values, re-discover an old talent and pay attention to your body. Aquarius / I House: Time to re-brand, re-energise and re-invent yourself! Use this time to gather information and adopt a non-reactive stance. You can tackle any unfinished business now. An opportunity to get clear on what you want and how to go about it. A chance to re-boot! Pisces / XII House: Think of this mercury retrograde period as a spiritual retreat of sorts. If you are involved with large institutions, you may experience frustrations and delays, but best take a back seat and let it all wash over you. A chance to rest and rejuvenate, record your dreams and listen to that inner voice! Wednesday, January 21: Mercury stations retrograde: Stop rushing, stop pushing, avoid purchases and signatures unless you are absolutely certain. Tuesday, January 27: Mercury sextile Uranus in Aries: Revisit bright Ideas and interesting proposals that came up mid-January. This aspect will repeat on March the 1st with the help of lucky Jupiter too, so watch this space! Friday, January 30: Mercury conjunct Sun in Aquarius: The magical seed of a new idea, project or relationship. End January to Wednesday 11 February: Mercury Retrograde Phase II: Time to re-invigorate, re-envision, re-invent, re-brand: leave the past behind and get a feel for the cosmic pulse of the future! Wednesday, February 11: Mercury turns direct: Double-check everything you do and be extra vigilant. This is when most mistakes happen! Sunday, March 1: Mercury sextile Uranus again: Time to move forward with all your plans!